The term Dian Xue describes an ancient martial art of attacking vital points on the human body. Striking these points can cause unconsciousness, severe injury, or even immediate death. This work tries to elucidate the underlying mechanisms of vital points and to answer the question, what makes them so vulnerable. After reviewing several Chinese, Indian and Japanese literature sources, a synopsis of 38 points is given. 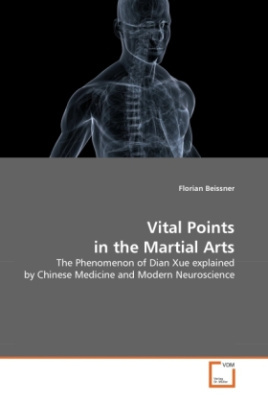 The points are then reviewed in the light of two different physiological concepts, one from Chinese medicine, the other one from modern neuroscience. From the eastern point of view many Dian Xue points correspond to classical acupuncture points. The properties, Chinese Medicine attributes to some of these points, explain their devastating effect in case of an overly strong stimulation. From a modern neuroscientific point of view we find a close correspondence of vital points with the so called maximum points of Head zones, i.e. areas that get painful in visceral diseases, an almost forgotten feature of Head's otherwise well known work. In this context, the theories of vasovagal syncopes and cuti-visceral reflexes offer explanations for the phenomenon of Dian Xue.